The EU leaders tried to project unity, despite Italy’s economic malaise. German Chancellor Angela Merkel, French President François Hollande and Italian Prime Minister Matteo Renzi met yesterday on the Italian aircraft carrier Giuseppe Garibaldi. The announced purpose was to discuss European policy after Brexit. The real discussion was about Italy’s economy and the steps needed to revive it after a long period of stagnation, which continued through last quarter. 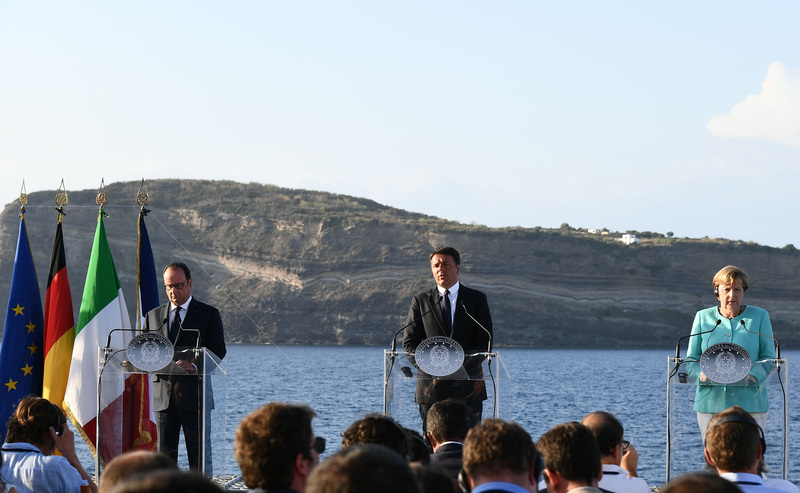 Italian Prime Minister Matteo Renzi, flanked by German Chancellor Angela Merkel (R) and French President Francois Hollande (L), gestures as he delivers a speech on Aug. 22, 2016 during a joint press conference held aboard the Garibaldi aircraft carrier on the harbor of the Italian island Ventotene. Before getting to the economic discussion, it is interesting that they chose to have the meeting on an Italian aircraft carrier – a more military location than Europeans normally prefer. The choice is even more interesting after a leak to German media suggested that Germany is considering resuming the military draft. The United States, and not only Donald Trump, has been increasingly critical of Europeans’ contribution to NATO. The European Union’s GDP is larger than that of the United States, but their collective contribution to their own defense is a fraction of the United States’. In addition, the limited capabilities of Europe’s militaries make the Europeans dependent on the Americans, so nations with significant security issues must accommodate the U.S., reducing Europe’s coherence. China continued to exert quiet but sustained pressures on India on the South China Sea issue. Beijing wants New Delhi to endorse its position on UN the International Tribunal award on the South China Sea under the United Nations Convention on Laws of the Sea (UNCLOS). The Philippines took the issue to the Tribunal over China claiming sea area perceived by Manila as its own. The Tribal verdict went against China. Beijing had declaimed to contest the Philippines at the Tribunal on the grounds that the Tribunal had no jurisdiction. China claims nearly 90 percent of the South China Sea on “historical” evidence which non-Chinese experts believe have no grounds to stand on. The sea is claimed variously by Vietnam, the Philippines, Malaysia and Brunei. Taiwan’s claim is similar to that of China. On territorial issues, Taiwan and China are in congruence as both sides envisage an eventual unification. China reserves the right to use force to unify Taiwan, which it claims is a renegade province of China. In Taiwan the opinion is divided though a significant number prefer a status quo. Nevertheless, with the return of the DPP government in Taiwan under President Tsai Ing- Wen Beijing smells some moves towards independence. Chinese Foreign Minister Wang Yi is scheduled to visit India this week. The main focus of the visit in the G-20 (20 most powerful economies in the world) summit to be held in Hangzhou, China, in September. China expects the South China Sea issue, especially the Tribunal award may come up. The G-20 does not include countries like Laos, Cambodia and Pakistan, most vocal supporters of China. India will be represented, and Beijing wants New Delhi by its side. On August 9, Chinese Foreign Ministry spokesperson Sua Chunying announcing Wang Yi’s visit, said he will “communicate with the Indian side about how to carry forward consensus between the two leaders and enhance mutually beneficial cooperation in different field in a bid to make sure that the relationship will keep growing as planned. 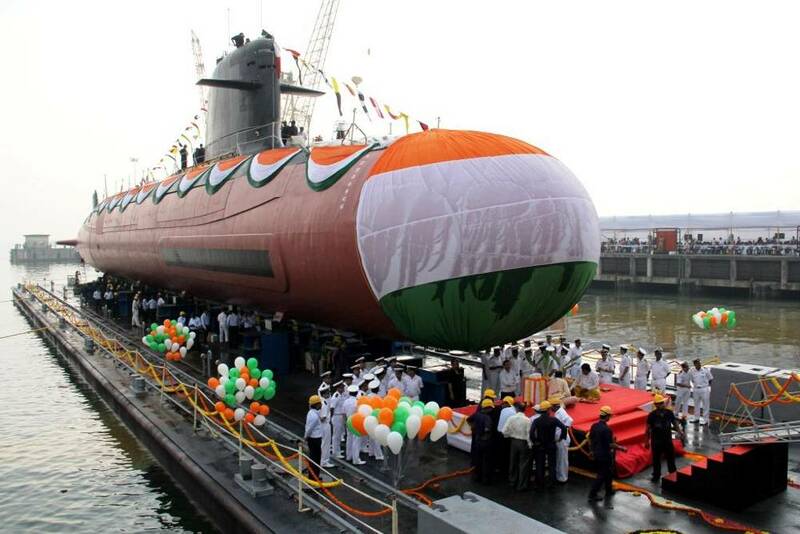 The Government of India is seized of the reported leak of documents related to the ongoing Indian Scorpene submarine programme as reported in sections of the media. The documents that have been posted on the website by an Australian news agency have been examined and do not pose any security compromise as the vital parameters have been blacked out. The Indian Navy has taken up the matter with Director General of Armament of the French Government expressing concern over this incident and has requested the French Government to investigate this incident with urgency and share their findings with the Indian side. An internal audit of procedures to rule out any security compromise is also being undertaken. The matter is being taken up with concerned foreign governments through diplomatic channels to verify the authenticity of the reports. The Government of India, as a matter of abundant precaution, is also examining the impact if the information contained in the documents claimed to be available with the Australian sources is compromised. The detailed assessment of potential impact is being undertaken by a high level committee constituted by the Ministry of Defence and the Indian Navy is taking all necessary steps to mitigate any probable security compromise. India has been steadfast in its commitment to non-proliferation: to not engage in the proliferation of weapons of mass destruction and their delivery systems to other states and non-state actors. Its relationship with international non-proliferation regimes, however, has not been without challenges, including with the export control regimes designed to serve the same objectives. Over the last decade, this relationship has changed dramatically. From once being a target of these mechanisms, India is now becoming an active participant. This improvement has been a result of better understanding between India and the international non-proliferation community on the country's role in the global cause. The global non-proliferation community has come to realise that it stands to gain by having in its fold a responsible power with advanced technologies such as India. This monograph makes an assessment of the prospects of India's inclusion to the export control regimes. It begins by analysing the technical parameters for membership and whether or not India meets them. This includes an examination of India's domestic export control system — both control list and legal framework. The next chapter delves into the political debates on India's membership to the four export control regimes. This takes into consideration the objections to India's accession that are being raised by some members of these regimes. The monograph closes by laying out a set of recommendations for the Indian government and the member countries of these regimes on both technical and political factors assessed, consideration of which could facilitate India's entry into the export control regimes. "India Aims To Be The World's Newest International Arbitration Hub"
India is seeking to become the world’s newest hub international arbitration hub by establishing a new arbitral center in Mumbai. The Mumbai Centre for International Arbitration (MCIA), which begins proceedings this month, will be India’s very first arbitration tribunal. Its supporters hope it will help bring the industry’s best practices to the country. The unveiling of the MCIA underscores the significant growth of India-related arbitration cases in recent years. It also highlights the government’s desire to make India an attractive destination for international arbitration and make it a more compelling destination for business by bringing more reliable adjudication to India’s corporate sector. Modi can't be faulted for raising the pitch as a tactical device to soften up Islamabad, but India would do well to remember the China factor in the equation. “Uska hal bhi hoga [That problem too would be solved],” said the Rashtriya Swayamsevak Sangh Chief Mohan Bhagwat on Sunday, referring to the so-called Azad Kashmir, Gilgit-Baltistan and Aksai Chin, parts of Jammu and Kashmir that are not with India. Whether occupied by Pakistan or China, they had to be brought back, he added. Parliament had twice passed a unanimous resolution proclaiming that Pakistan-occupied Kashmir, or POK, was an integral part of India and even though it was somewhat complicated, the government would find a way out, Bhagwat said, while speaking at a meeting in Agra whose aim was to encourage Hindu couples to procreate more, in the face of a “demographic imbalance” caused by what the RSS characterised as a disproportionate increase in India’s Muslim population. Bhagwat was following up on Prime Minister Narendra Modi’s remarks on August 12 at an all party meeting on the situation in Kashmir. There was a need for the government to highlight the plight of the people of POK to the world community, Modi had said. Revisiting the theme in his Independence Day address, Modi expressed his appreciation for the positive response he had got for his August 12 remarks from “the people of Balochistan, the people of Gilgit and the people of POK”. That has been enough to set the proverbial cat among the pigeons. The chasm between India’s demographic bulge and the employment opportunities required to absorb it has been a staple in any debate about economic growth, and rightly so. The destabilizing political and social effects of a large unemployed population and the productivity loss from under- or poorly manned industries are anathema to any developing nation. Increasing levels of technology integration in production and business processes complicate the picture further. The National Democratic Alliance government has focused on a core aspect of the employment issue with the Skill India drive. But it will need to navigate an increasingly complicated landscape. Recent data from the Organisation for Economic Co-operation and Development puts the skills shortage in India—measured as a percentage of firms with ten or more employees that have difficulty finding qualified employees—at 61%, among the highest ratios. This is not surprising. The Labour Bureau Report 2014 had pegged the skilled workforce in India at a dismal 2%. To its credit, the United Progressive Alliance administration had attempted a structured approach to the problem with the National Skill Development Corporation (NSDC)—a public-private partnership aimed at funding for-profit vocational training initiatives, now part of the Narendra Modi government’s skilling initiative. Winning Helmand is essential to long-term Afghan peace. Helmand, one of the largest provinces of Afghanistan, has long been considered the center of gravity of the Taliban insurgency. This is because of its strategic significance both in terms of economics and politics. From an economic point of view, Helmand is an arable region, producing more than 90 percent of Afghanistan’s opium cultivation. The harvest of opium has created a substantial amount of revenue and has been fueling the Taliban’s war machine since its defeat in 2001. In terms of political significance, controlling a vast province such as Helmand with Lashkar Gah, its capital city, along with fourteen districts will politically strengthen the Taliban. In addition, from a military perspective, governing an urban area with potential for economic and political prominence would be a major victory over the fragile Afghan government. More importantly, it will negatively affect the peace process, which remains the only solution to end the Afghan conflict. Additionally, any momentous success by the Taliban against the Afghan army would weaken the government’s ability to negotiate from a position of strength. For this reason, the prospect of a political settlement will remain even gloomier in case the Taliban take more territory. Since 1991, the influence of the Russian Federation in Central Asia has been on the decline, and many have assumed that the United States would move in to fill the resulting vacuum. US influence has indeed increased, at least in certain countries of that strategically important region. But a far more important external player there now is China, which is engaged in what some observers call “a quiet expansion” or even “the Sinification” of Central Asian countries (see China Brief, July 29, 2011; see EDM, January 24, 2011; November 3, 2015; February 10, 2016;March 10, 2016; April 8, 2016). Although they are often overlooked, China has some real advantages in this effort. It is geographically closer; it is Asian and therefore not associated with past empires, Russian or Western; it does not share the concerns of Russia about retaining control at all costs, or of the United States about promoting democracy and human rights. And in contrast to the two other players, it has enormous financial resources it can put in play to help the hard-pressed countries in Central Asia. Nowhere has the spread of Chinese influence been greater than in Tajikistan. Dushanbe-based commentator Arkady Barayev says that this has been the result of a longstanding calculation. Namely, China has always sought first to expand into neighboring countries that are internally weak. There, it establishes its influence by taking control of industrial enterprises and natural resources. Only after that does it push to dominate the political sphere or even “seize” territory (Centrasia.ru, July 27). "Future Warfare in the Western Pacific: Chinese Antiaccess/Area Denial, U.S. AirSea Battle, and Command of the Commons in East Asia"
Aircraft assigned to Carrier Air Wing (CVW) 5 fly in formation above the aircraft carrier USS Kitty Hawk (CV 63), Pacific Ocean, June 23, 2008. Many policy analysts have suggested that China is developing antiaccess and area denial capabilities that could force the U.S. military out of the Western Pacific. The threat, however, is limited. China will likely acquire the ability to partially restrict the U.S. military's freedom of movement in the East and South China Seas, but the United States will maintain a sphere of influence sufficient to protect most of its allies in the region. The authors have written a policy brief based on this article, "Can the United States Command the Commons in East Asia?" In China’s narrative, the rise is still peaceful. The nation built military installations on reefs and rocks in the South China Sea simply because China claims to own them from time immemorial. As Hu Shijin, editor-in-chief ofGlobal Times, told Quartz in a recent interview. “We can’t lose these islands.” Fighting the Philippines arbitration case in court could result in defeat, and did, a risk China wanted to avoid. China decided not to participate in the proceedings or accept any decision of the arbitral tribunal set up under the UN Convention on the Law of the Sea. From the Chinese standpoint, the South China Sea is a core interest. There can be no backing down. China sees no need to challenge the US militarily and wants to avoid confrontation unless pushed. “An information technology-based war at sea is sudden, cruel and short…” washow the Chinese military characterized a peer-to-peer naval conflict at sea in a public statement at the beginning of the month during PLAN naval exercises. The exercises, occurring in the East China Sea, were designed to increase the PLAN’s “assault intensity, precision, stability and speed of troops amid heavy electromagnetic influences” or in other words, electronic warfare. China and the United States are preparing and force posturing to contest the electromagnetic spectrum in the South China Sea and further north in the East China Sea. One of the defining characteristics of China’s actions in the South China Sea has been the construction of radar installations across the majority of its artificial features in the region.According to CSIS’s Asia Maritime Transparency Initiative, a variety of radar installations have been constructed on Cuarteron Reef, Fiery Cross Reef, Gaven Reef, Hughes Reef, Johnson Reef, Mischief Reef and Subi Reef. The purpose of these installations will vary and some will have dual uses—for instance a few of the radars on Fiery Cross and Subi Reef will be used to facilitate air operations from the runways housed on those features—but together, the facilities will significantly expand the real-time domain awareness and ISR capabilities of the PLA over a large portion of the South China Sea. Publically, radar facilities appear to be less escalatory than anti-air missile batteries, artillery or even runways in terms of the infrastructure installed on the artificial features. They do somewhat support China’s officially stated intentionof using the features for search and rescue. But the reality is that they’re of enormous use to the PLA and a pressing concern for other nations operating in the region. Two decades ago, Osama bin Laden officially launched al-Qaeda’s struggle against the United States. Neither side has won. Exactly two decades ago, on August 23, 1996, Osama bin Laden declared war on the United States. At the time, few people paid much attention. But it was the start of what’s now the Twenty Years’ War between the United States and al-Qaeda—a conflict that both sides have ultimately lost. During the 1980s, bin Laden fought alongside the mujahideen in Afghanistan against the Soviet Union. After the Soviets withdrew, he went home to Saudi Arabia, then moved to Sudan before being expelled and returning to Afghanistan in 1996 to live under Taliban protection. Within a few months of his arrival, he issued a 30-page fatwa, “Declaration of War Against the Americans Occupying the Land of the Two Holy Places,” which was published in a London-based newspaper, Al-Quds Al-Arabi, and faxed to supporters around the world. It was bin Laden’s first public call for a global jihad against the United States. In a rambling text, bin Laden opined on Islamic history, celebrated recent attacks against U.S.forces in Lebanon and Somalia, and recounted a multitude of grievances against the United States, Israel, and their allies. “The people of Islam had suffered from aggression, iniquity and injustice imposed on them by the Jewish-Christian alliance and their collaborators,” he wrote. It has been a bloody summer in Europe so far, with ISIS-linked and inspired attacks taking place in Nice, Wurzburg, Ansbach, Normandy and, just recently, Charleroi. The attacks seem to have been the work of a few individuals and the body counts have been low, with the exception of the attack in Nice, which claimed at least 84 lives. The number of attacks, the varied but generally unsophisticated methods, and the lack of strong ties between the attackers and ISIS leadership in Iraq and Syria demonstrate a major difference between ISIS and al Qaida. Namely, ISIS has adopted the “Big Box Retail Outlet” strategy of branding while al Qaida remains committed to framing itself as a luxury brand. ISIS’s big box retail approach consists of several important variables: reach, consistency, its positioning as a loss leader, psychological appeal and freshness (or keeping things new and current). Al Qaida, as the luxury alternative, is more focused on exclusivity, pedigree, price-setting and seeking adherents that truly understand its message. For ISIS, it’s a numbers game, both in focusing more on the quantity than the quality of attacks, but also in terms of reach and thus, recruitment. To reach as many potential recruits as possible, ISIS relies on several mediums to communicate its propaganda, from print publications like Dabiq to videos produced in multiple languages. It even retains an unofficial wire service, Amaq News Agency, to disseminate messages, including claims of responsibility for attacks. Moreover, by delegating the bulk of its media output to provincial information offices that focus on local and regional events, ISIS is demonstrating a lack of concern with staying on message. Political debates on NATO’s force posture in the Baltic region could have been better served by a higher degree of openness and candor in the run-up to the Warsaw Summit. Unnecessary constraints on those debates were partly responsible for delaying NATO’s arrival to the Baltic region in a military sense during the whole post-enlargement decade. Those political inhibitions also partly explain the insufficiency of the Warsaw Summit’s decisions on the Allied force posture in the three Baltic States vis-à-vis the potential threats from Russia. On the positive side, the summit’s decisions signify that the three Baltic States’ accession to NATO is not merely a political process, which is how NATO had essentially treated it since 2004. First, NATO has now taken the initial (albeit tentative) steps toward integrating Estonia, Latvia and Lithuania into the Alliance’s defense system. Second, the three Baltic States no longer face the possibility of becoming de facto a buffer zone devoid of Allied forces (a possibility that had been discussed apprehensively in the region long after NATO’s political enlargement there). And thirdly, the Alliance’s force posture is now shifting from symbolic reassurance of the Baltic States toward deterrence of Russia, at least in aspirational terms for the time being. Despite Russia’s economic crisis, which has already imposed restrictions on military spending (see EDM, May 3), the Kremlin is trying to implement a questionable buildup in the Arctic, aimed at strengthening Russian military might. During a recent board session of the Russian Ministry of Defense, Minister Sergei Shoigu paid special attention to the implementation of the “2020 Activity Plan by the Northern Fleet.” He reminded the participants that the Northern Fleet, an “inter-service strategic formation,” was formed over two years ago “in order to protect [the] northern borders of Russia” (Mil.ru, July 27). He mentioned in particular that the construction of “closed-loop” (self-sustaining) military towns will be finished on the Franz Josef Land archipelago and the Novosibirsk Islands in 2016. A joint situational awareness system is being created to support air defense. The Russian defense ministry intends to build or reconstruct ten airfields in the Arctic. “Russia’s Federal Agency for Special Construction [Spetsstroy] is building military infrastructure facilities on six islands in the Arctic,” Izvestia quotes a ministry official. According to this source, over 100 tons of military equipment for more than 150 facilities are planned to be delivered to these remote military garrisons. In addition to the materiel supply, more than 190 tons of construction materials—including precast concrete, cement, metal, pipes, fittings and equipment—will be delivered to the Arctic for building the facilities (Izvestia, July 11). The construction and renovation of runways and other structures is ongoing at Severomorsk-1 airfield (Murmansk oblast) as well as Nagurskoye air base (Alexandra Land Island, in the Franz Josef Archipelago). The airfields at Rogachevo (Arkhangelsk oblast), Tiksi (Yakutia Republic) and Temp (Kotelny Island in the Arctic Ocean) are also under construction. It was announced that beginning next year, Tiksi is to become the permanent base for a formation of high-altitude MiG-31 interceptors (Rossiiskaya Gazeta, July 19). After the results of the Brexit referendum, many EU governments and officials went out of their way to emphasize that the vote did not herald the end of the European Union and could even make it stronger. For these officials, presenting the vote as an oddity is essential to preserving the bloc. After all, if the Brexit is not an exception, then it could become an example for other countries to follow. The specter of the British precedent will shape relations between the bloc and the United Kingdom for years to come, throughout the negotiations process and afterward. By now, it is clear that London is trying to delay its formal discussions to leave the European Union for as long as possible. Two months after the vote, the British government still faces conflicting pressure from the country's "leave" and "remain" camps as it tries to develop a strategy for exit negotiations, tentatively scheduled to begin in early 2017. The European Union, meanwhile, has dilemmas of its own with which to contend. The bloc's political heavyweights, Germany and France, will each hold general elections in 2017, and Italy may well join them if a referendum on constitutional reforms fails before the end of the year, precipitating the fall of the government. Dealing with domestic opposition parties that want their own versions of the Brexit referendum, Berlin, Paris and Rome want to send their voters the message that the costs of leaving the European Union outweigh the benefits. At the same time, Europe's main political players understand that prolonged uncertainty will hurt the Continent's fragile economic recovery. An agreement, therefore, is inevitable, even if negotiations could continue well into the next decade. "Choose Your Own Adventure: The Future of the World"
It's not just the U.S. presidential platforms that will shape global politics in the years ahead — it's Americans' theories of how the world works. However tempting it is to keep writing about Donald Trump, I'm going to move on to less bizarre topics. Last week I participated in a panel at the American Academy of Arts and Sciences on the implications of the Brexit vote (along with Leslie Vinjamuri of the University of London and Barry Posen and Francis Gavin of MIT). Their comments got me thinking — and not for the first time — about where the world is headed these days. It's easy to understand why people think the current world order is rapidly unraveling. Despite steady reductions in global poverty, the continued absence of great power war, and mind-boggling advances in science and technology, world politics doesn't look nearly as promising as it did a couple of decades ago. It's still possible to offer an upbeat view of the foreign policy agenda — as Joe Biden recently did— but the vice president is not exactly the most objective judge. He thinks the next president will be able to build on the Obama administration's successes, but a more candid evaluation would conclude that the next president — whoever it might be — is going to face some serious challenges. “In science, the term observer effect refers to changes that the act of observation will make on a phenomenon being observed. This is often the result of instruments that, by necessity, alter the state of what they measure in some manner. “It was, perhaps, the most unusual episode in the long running duel between the two giants of twentieth century economic thought. During World War Two, John Maynard Keynes and Friedrich Hayek spent all night together, alone, on the roof of the chapel of King’s College, Cambridge. Their task was to gaze at the skies and watch for German bombers aiming to pour incendiary bombs upon the picturesque small cities of England…. To keep America safe we need to have a government (including military and police) that works as it should as well as a society that works for all; and to stop destabilizing the world while putting America – the 99% disenfranchised economically, politically, and socially – first. Getting there is not rocket science; it requires a Grand Strategy and intelligence with integrity. The last modern Grand Strategy review was conducted at the direction of President Dwight D. Eisenhower in 1953 – Project Solarium. Everything since then, including our Quadrennial Defense Reviews and our National Military Strategy, has been a mélange of platitudes devoid of holistic analytics, true cost economics, or devotion to the public interest. The military-industrial complex (and other complexes including the agricultural and pharmaceutical complexes) – and the financial class set free to run amok when the Clinton Administration removed all legal restraints on what Matt Taibbi calls “Griftopia,” have together destroyed the heart and soul of America: its blue collar master class and white collar middle class. A Grand Strategy would seek to restore the foundation of national power that Hans Morgenthau emphasized: a strong, healthy, fully-employed public. It would also seek to assure that industrial reform is job and revenue-neutral across every political jurisdiction (not as hard as it might sound). Most importantly, a Grand Strategy would ensure that every threat is addressed; that every policy is coherent and affordable; and that no demographic is left behind. Today the candidates and the intelligence community focus only on two of the ten high-level threats to humanity, war and terrorism – they ignore poverty, infectious disease, environmental degradation, genocide, other atrocities, proliferation, and transnational crime including Wall Street crime and non-profit charity crime. All four candidates are lacking in holistic policy development and not of them is capable of producing a balanced budget that eschews borrowing from banks, eliminates the average 50% waste, and is totally devoted to lifting up the 99% whose backs the 1% have literally broken en passant. NOTE: The below essay started out to answer the question, “does the U.S. Army need to be able to fight a conventional war with China and/or Russia outside the USA?” The answer is no. How I got to that answer should inspire a conversation. I include a concept for getting Congress to go along with radical change by making such change job and revenue neutral from district to district. Homeland Security spends $20M to develop devices to find bombs being transported in ships, on metro systems, or in public places. The Homeland Security Department is trying to ramp up wearable devices that can detect nuclear radiation. DHS has made a handful of awards for well-developed prototypes, of wearable products from companies including Leidos and Physical Sciences, Inc., according to a recent FBO posting. Last year, DHS made a broad agency announcement soliciting proposals for so-called Wearable Intelligent Nuclear Detection, orWIND, technology. Employees would wear the products to ensure nuclear devices weren’t secretly being transported in areas like marine vessels, metro systems, or other public areas, according to DHS. DHS was specifically searching for ”advanced technology demonstrations,” which are for “mature prototype capable of providing reliable performance measurements in a challenging and realistic, albeit simulated, operational environment,” the BAAsaid. Awards were for roughly $4 million to $5 million. DHS’ Domestic Nuclear Detection Office, whose mission is to protect the U.S. from nuclear devices, was specifically searching for a modular wearable system that could sense, localize and identify nuclear particles, including gamma rays and neutrons. Raytheon has presented the new Cyber and Electromagnetic Battle Management (CEMBM) tool for the US Army at Cyber Quest, an army event highlighting cyber-security requirements and priorities. CEMBM integrates cyber and electromagnetic spectrum awareness capabilities into Raytheon's Electronic Warfare Program Management Tool (EWPMT), which evaluates events in the spectrum. "With CEMBM, teams now have a common operational picture where they can move back and forth, at will, between cyber, EMS and physical terrains." It is said to provide a shared situational understanding of electronic warfare (EW), and management and control of organic assets. CEMBM will allow EW officers to discreetly determine the best path forward, jam the enemy's communication ability and prevent them from using cyber emitters. Raytheon Space and Airborne Systems airborne information operations director Frank Pietryka said: "The challenge lies in operating in the EMS while managing it in a way that minimises negative impacts to other players and parts of the mission. "With CEMBM, teams now have a common operational picture where they can move back and forth, at will, between cyber, EMS and physical terrains. It is a true game changer." This Request for Information, DARPA-SN-16-58, from the Defense Advanced Research Projects Agency's (DARPA) Tactical Technology Office (TTO) seeks ideas, methodologies, and approaches solely for information and planning purposes. DARPA is interested in identifying novel, flexible, mobile layered defense systems and component technologies that could be leveraged to improve force protection against a variety of sUAS threats and tactics, could be fielded within the next three to four years, and are structured to rapidly evolve with threat and tactic advancements. DARPA is interested in exploring the potential for developing and demonstrating system solutions, including sensors and effectors, to enable detection, identification, tracking, and neutralization of sUAS threats. The solution should be scalable and modular such that it could be deployed in multiple defense applications on a variety of platforms (vehicles and vessels); the solution is intended for the defense of fixed and mobile ground and naval forces. To the greatest extent possible, it should also address rocket, artillery, mortar, and other conventional threats. System flexibility, deployability, and affordability will be major design drivers, as the system will only be an effective deterrent and defensive capability if it can be widely deployed to protect a large number of assets. Therefore, this RFI seeks information on concept performance capabilities, unique and enabling technologies, technology maturity levels, system architecture, concepts of operations, and system affordability. Responses to this RFI will be used to determine attendees for a workshop in Arlington, VA. In addition, the information may potentially support the development of new DARPA programs that could enable a revolutionary layered defense approach to achieving mobile force protection, including counter-unmanned air systems (CUAS) capabilities. Refer to the attachment for a complete copy of this RFI.